Learn the location of all 8 Eggos in Stranger Things: The Game and how to unlock Eleven as a playable character. If you want to unlock Eleven as a playable character in Stranger Things: The Game, you’ll need to know where to find all of the Eggos that are hidden throughout the game. There are 8 collectible Eggos in total. These Eggos can typically be collected as you make your way through the various chapters in Stranger Things: The Game. If you’re having a hard time finding all of the Eggos, we’ve got you covered. Below, we’ve listed the locations of all Eggos in Stranger Things: The Game in order to help you unlock Eleven as a playable character. Below, we'll show you where you can find all 8 Eggos in Stranger Things: The Game. Eggo 1: You’ll find the first Eggo Waffle hidden inside Hawkins Lab. To collect it, defeat the Hawkins Lab boss in Chapter 1 of Stranger Things: The Game, then pick up the Eggo it drops. Eggo 2: You’ll find the second Eggo Waffle hidden in the Forest Maze. To collect it, defeat the Forest Maze boss in Chapter 2 of Stranger Things: The Game, then pick up the Eggo it drops. Eggo 3: You’ll find the third Eggo Waffle in the wreckage of a Conspicuous Van. To collect it, defeat the Conspicuous Van boss in Chapter 3 of Stranger Things: The Game, then pick up the Eggo it drops. Eggo 4: You’ll find the fourth Eggo Waffle vacuum sealed within the Sewers. To collect it, defeat the Sewer boss in Chapter 4 of Stranger Things: The Game, then pick up the eggo it drops. Eggo 5: You’ll find the fifth Eggo Waffle in Hawkins Public Library. To collect it, defeat the Hawkins Public Library boss in Chapter 5 of Stranger Things: The Game, then pick up the Eggo it drops. Eggo 6: You’ll find the sixth Eggo Waffle hidden inside the Hawkins Lab Bunker. To collect it, defeat the Tentacle Hydra boss in Chapter 6, then pick up the Eggo it drops. 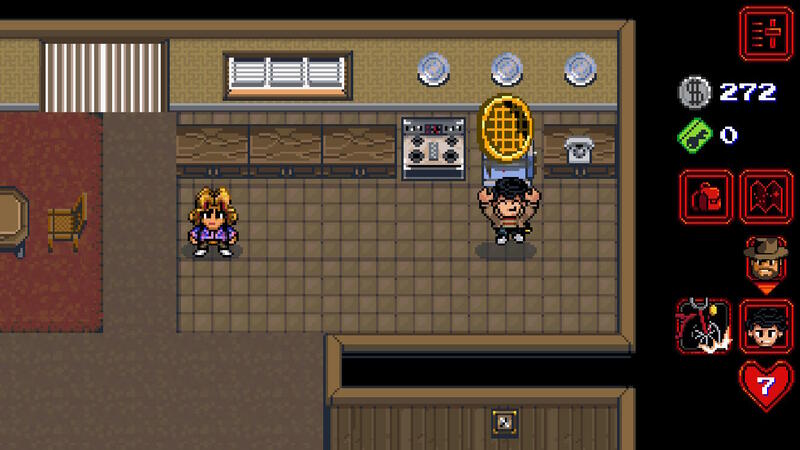 Eggo 7: You’ll find the seventh Eggo Waffle inside Wheeler House refrigerator. Head southwest to the Wheeler's house (south of the High School), then open the refrigerator on the first floor to reveal an Eggo. Eggo 8: You’ll find the eighth and last Eggo Waffle hidden inside Bradley’s Big Buy Store. First, head to Bradley's Big Buy Store near the center of the map (northeast of the Middle School). Walk past the clerk and head northeast to the corner of the store. Here, you'll need to use Nancy to break through a wall. Then, head through the wall into a freezer room to collect the last Eggo. Once you’ve collected all 8 Eggos, you’ll need to head to the northern forest (west of the Sewer) and locate the door at the top of the map. Head through the door, then interact with the box inside to unlock Eleven as a playable character! Need a little help finding Gnomes? We've got you covered! Click here to read through our guide on all Gnome locations in Stranger Things: The Game. By reading through this guide, you should now know the location of all 8 Eggos in Stranger Things: The Game and how to unlock Eleven as a playable character.